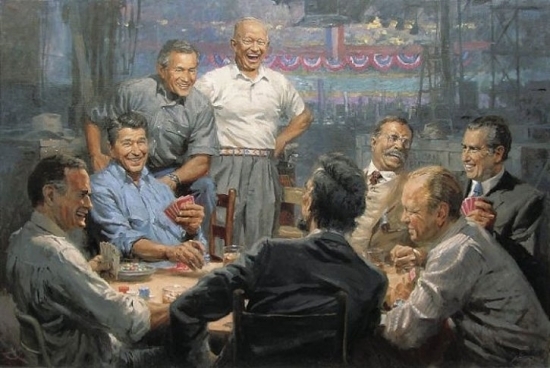 "GRAND OL' GANG" - the Republicans (counterclockwise around the table beginning in lower left): George H.W. Bush (1989-1993), Abraham Lincoln (1861-1865), Gerald R. Ford (1974-1977), Richard M. Nixon (1969-1974), Theodore Roosevelt (1901-1909), Dwight D. Eisenhower (1953-1961), George W. Bush (2001-2009, and Ronald Reagan (1981-1989). Released simultaneously with its Democratic counterpart ("TRUE BLUES" - also available here) as "BIG DAWGS" PLAYING POKER for the 2008 election year, this limited edition print is individually signed and numbered by the artist.